We would like you to experience our warm and caring service, and make your experience with us a comfortable and positive one. Please enjoy our refurbished rooms where you can relax with our daily newspaper and current magazines. A large screen TV is provided for your viewing entertainment and tea and coffee facilities are available for your convenience. 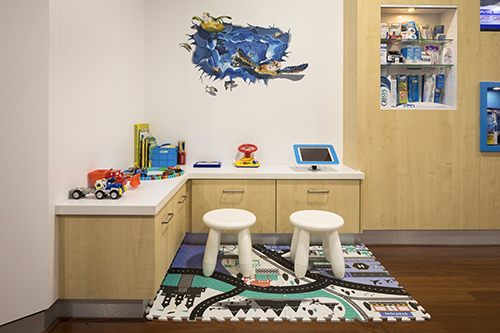 We also have a kids corner to entertain the children with IPAD, books and games. Our clinical rooms are equipped with the latest technology, feel free to bring along your headphones and portable music device or you can enjoy watching our ceiling mounted televisions. For your comfort, a neck pillow and/or blanket is available on request. 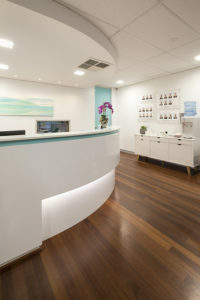 Our highly skilled and professional clinicians provide comprehensive dental care with the highest of standards in all aspects of dentistry, using the latest techniques, treatments and restorative materials available. Our dental team will provide comprehensive dental care and are supported by a team of dedicated dental assistants and dental therapists and hygienists. Upon your arrival at our practice you will be greeted by our friendly staff who will request you to fill in a new patient medical history form and can assist in answering any questions. One of our dental professionals will do a thorough examination and will discuss any treatment options and possible next steps. Feel free to contact our team should you have any further questions about your first appointment. At Harmony Dental, we accept all major health funds. We are proud to announce that we have recently become a Bupa Members First Platinum practice and are a preferred provider for HBF. If you have any enquiries regarding claiming your health benefits, please do not hesitate to contact us. As a Members First Platinum Practice, eligible Bupa members* will pay nothing for dental checkups, scale and cleans, bitewing x-rays, fluoride treatments and mouthguards. Plus, you’ll get all the benefits of Bupa’s Members First network, like more back (60-100% back on most other dental services) and gap-free dental for kids (for eligible kids under 25). *Check with Bupa- fund rules and eligibility criteria apply.